This 220 page greenhouse journal is designed to be a two year record of your greenhouse gardening activities. The notes kept in your personal journal will become your best reference guide to gardening, whether it be outside or in your greenhouse. The best source of any information for any gardener comes from notes you've recorded in your own personal journal. This greenhouse journal is designed for daily notes over weekly periods. It is often difficult to remember details regarding your greenhouse or gardens, and this journal will aid you in planning for your next season. For those of you who start seeds, propagation records are invaluable, as this is where everything begins. For example, when seedlings become visible, you can determine when to transplant. Record of greenhouse temperatures or outdoor temperatures Propagation techniques Transplanting and flowering times Fertilizing schedule Additional notes on plant development. At the end of the journal is an excellent resource section that includes greenhouse gardening tips, greenhouse and accessory suppliers and sources of seed catalogues. This journal would make an excellent gift for any gardener, or why not treat yourself. 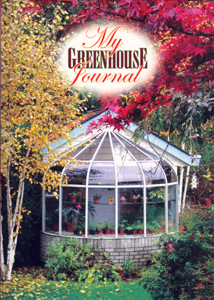 Order your Greenhouse Journal today, only $15.99 and plus shipping anywhere in Canada! Take care with the watering. Most plants benefit from reduced watering and no feeding during the winter unless they are flowering freely. Ensure that short-day plants like poinsettia receive less than twelve hours of day length. This is important and ensures that they flower at the correct time. Dead head and de-leaf regularly. It is very important during the autumn and winter in order to prevent disease build up. In mild weather be sure to ventilate adequately. What better time than Thanksgiving to offer our heartfelt thanks to all of our customers! We appreciate your business and wish all of our customers, friends and family a happy and safe Thanksgiving!